How do I know you’re a genuine psychic? The short answer is – you don’t, well, not until you have seen me! Getting a psychic reading is a personal decision and I encourage you to do research before booking me. I have nothing to hide, and no problems referring you, if I feel a colleague is a better fit. It’s more important to me that you have a positive psychic experience. See my video and post on Intuition vs Superstition for an example of my ethical approach. I make it easy for you to get to know me by writing openly on this site – no fuzzy pictures or woo-woo statements, just 300+ posts of my true-life experiences. This is my calling, not a side-job or hobby. Since 2007, I have read for 3,000+ people and the reviews speak for themselves – see my Testimonials page for over 75 stories from happy clients. This is not a forgiving industry, especially in a small city like Brisbane – if you’re a fake or fraud, clients don’t come back, and they certainly don’t recommend their friends. See my famous people readings for examples of my readings style and what numerology and palmistry can tell you. This article on psychic ability versus spiritual maturity may be helpful. I am blessed to have plenty of return clients and an excellent reputation. I make a point of myth-busting the New Age industry, see this post on Spiritual Whitewashing. Just ask around, or check out my facebook pages The Numbers Queen and Master 11 Lifepath Numerology. Why do you work by phone and Skype? I’m used to in person psychic readings. It’s weird but true – it’s easier and faster for a highly sensitive person (psychic) to read for you over the phone or by Skype. This is because there is less energy transfer and both people are in their comfort zones (e.g. at home). It’s also good for the planet (less carbon emissions) and saves you time. If you are a sceptic, then having a phone or Skype reading is especially powerful! See this article on how Spirit uses technology to reflect our energy and trust. Phone sessions reduce the chance of cold reading – a psychic has to be genuine (see above) to deliver the goods, especially if a client doesn’t talk much. I used to only do in-person readings but after years of experience I now work by distance. This allows me to nurture my young children and to reach people all over the world instead of travelling. I moved to this method when I fell pregnant and my vibration went up – as soon as people touched me, I knew their life history and that’s when I closed my physical office and switched over. 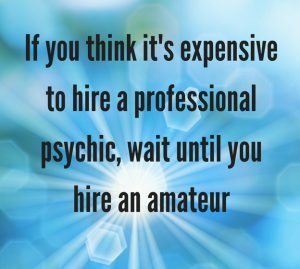 You’ll find that most professional psychics (especially full-time ones) work by phone or Skype. That said, I do offer occasional in person readings on request, at events and workshops – join my email list (see homepage) to receive invitations. Can you really do palmistry by Skype or phone? Absolutely – I’ve done thousands of calls this way! You’d be amazing what a psychic can see in good quality hand photos (discussed below). All modern phones come with great cameras. I combine palmistry, numerology, Tarot and clairvoyance so the information flows smoothly no matter how we meet. I’ve read so many hands now, I intuit patterns quickly even from pictures. Think of a baker who’s made bread for decades and knows how the loaf will turn out before it finishes baking. If you want to ask detailed questions about your lines and markings then you can join a palmistry workshop as these are held in Brisbane. If you have found my website or details, then you are ready for a reading with me. Especially if you see 11:11!! I mainly work with people who are at major turning points and are about to make leaps of faith. They are looking for guidance on issues that will have a long-term impact on their physical, emotional, mental and spiritual futures. From a numerology perspective, a reading within a few months of your birthday is ideal, as that’s when you enter a new Personal Year. How often should I have readings? It depends on what you are going through. I do in-depth psychic readings, which include a 12 month forecast, so most people see me between 1-2 times a year. However I also work with clients as a spiritual coach, teaching them to meditate, to connect with Guides and to develop their psychic abilities – in these instances, a session every 3 to 4 months is perfect. I am not a fan of constant readings. If you are dealing with a true psychic, you will receive the same messages until you are ready for the next step. A better outcome would be to learn to do readings for yourself (e.g. through studying books or courses), and to supplement these experiences with professional psychic readings every now and then. I’m a psychic reader who defies expectations, and my clients are the same. They’re entrepreneurs, teachers, healers, therapists, politicians, tradies, scientists, managers, domestic goddesses, real estate agents, accountants, doctors, lawyers, nurses, government workers, and students. Most live in Brisbane, but many come from overseas. I also read for the odd celebrity and fellow psychic. The people I see are go-getters and bright sparks who want to stay on track. They know that there’s more to life than meets the eye. Does this sound like you? Although 2 in 3 of my clients have seen a psychic before, very few have experienced in-depth palmistry or numerology. These techniques take years to master, and the results speak for themselves – they are repeatable, accurate and scientific. Due to the need to prepare before we meet, I don’t take same day bookings, but it’s definitely worth the wait. You can’t rush quality. See clients’ results below or read my Testimonials page. A reading with me gives you the power to make the most of life’s opportunities. You check the weather before going out, right? So it makes sense to check your cosmic forecast before making major decisions. This is something that people in the East have done for centuries. The system I use provides you with the best months and years to take action on your goals. Everything is recorded, so you can monitor the predictions for yourself. -They leave knowing that their gut instincts are trustworthy. -A lasting sense of peace and self-love that comes from learning this is not their first lifetime and won’t be their last. -New business opportunities appear as predicted. -Job offers appear quickly and easily once we remove the blocks. -People begin seeing 11:11 on clocks, or 111, 222, 333 patterns. These signs indicate a leap in consciousness. -Clarity regarding dreams or nightmares and what they mean. -Ghost hauntings and feelings of discomfort disappear. -Relief of mental and physical pain after energetic cord clearing. -Increased financial flow and positive experiences with money. -Meeting romantic Soulmates and falling pregnant as hoped for. -Improved physical wellbeing after releasing stuck energy. -Relief of writer’s block after just one session. -Successful house sales and/ or moves. An understanding of their address numerology. -Improved relationships between family members, especially parents and children. I always support clients to focus on solutions, not events. You can be happy or right, but never both. How do I know these results weren’t self-fulfilling prophecies? Because I can describe past events as well as potential future ones. Certain lessons in life are set in stone, while other tests are up to you – it pays to find out what’s around the corner! If psychic ability is a gift, why do you charge for readings? Because I’m living in a material world and a girl’s gotta eat. Like most psychics, I do gift readings for people in need, and charity work, but I also have bills to pay and a family to feed. Not only that, I believe that the idea psychics and healers should work for free is the worst kind of energetic and political suppression. How can you change the world when you can’t even meet your basic needs? Self-responsibility is part of enlightenment. From harsh experience, I’ve also learned that people don’t value free stuff. They just don’t follow advice they haven’t paid for. Over three years, I answered almost one thousand queries on facebook, and most people never replied. That’s why I turned off my private messaging function. In contrast, my readings and workshop clients send amazing feedback, which keeps me constantly inspired. Why do you charge more than other psychic readers? Because I give a LOT, and I’m here to transform the psychic industry, not burn out. We don’t need any more flaky readers who can’t be found a year after you met them. At the beginning of my career, I did around 1, 000 readings for an average of $100 or less, so I know my stuff. I also work part-time, due to having two kids under two. At this stage of my career, I want to help people ready for massive change and healing (especially 11:11 See’rs). I believe I’ve contributed as much as I can at the lower price levels. There are many psychics who offer emergency readings, but I am no longer one of them. I prefer to help you rebuild after the earthquake, as that’s a more interesting crossroads. My husband Kris Anderson does Tarot readings, and is an expert at short-term forecasts, urgent readings and helping with decisions. He works in person from Chermside West, by phone and Skype. Call him on 0428 626 727. 80% of problems in life are caused by rushing. When I do something, I do it properly. The peace of mind you receive from a genuine reading is priceless. My new clients readings take two calls x one hour. That’s not including the hours I spend before the call, creating a chart and tuning in, or the several hours a week I spend meditating, exercising, healing myself, studying, reviewing client records and seeing coaches. My time works out to around $150-200 an hour, which is similar to other major psychics. My coaches are $400-1000 an hour in comparison. That said, I’m aware people need time to save up, which is why I offer a 50% deposit, with the remainder due 1-2 weeks prior. I also recommend reading my article on 8 Chakra-Based Tips for Creating Cashflow. In the end, you get what you pay for. I deliver top quality readings because I can energetically afford to – I only do a handful of sessions a week, so I don’t have to hold back. That means that you get 100% of my attention when we’re working together. A reading with me costs more up-front, but it will save you days, months, maybe decades of hassle, searching for similar information. There’s also no hidden cost of doubt and insecurity that come from a sub-standard reading based on guesswork. Why does it take you up hours to prepare my reading? Because I not only meditate, I look at your hand photos, research and write your numerology chart, I tune into your lifepath, talk to your Guides, check my Tarot cards – you get the picture. I pretty much do a mini-reading before we even speak. Same goes for followup sessions – I update your chart and look over our notes for around half an hour to make sure every minute we talk is packed with information. I hate wasting time, yours and mine. That’s what makes me one of the most accurate psychics in the industry. I want to connect with a deceased loved one, do you do mediumship readings? No. Although I receive messages from Spirit and occasionally, from passed over loved ones, it is not my speciality. See Vicki Haspels or Caroline Byrd for these sessions. I’m scared of having a psychic reading in case you tell me something negative. There’s no way around this – sometimes the guidance I receive for you is going to challenge your expectations. Isn’t that why you’re having a reading? To find out what you don’t know you don’t know? The good news is, I have done a huge amount of personal growth work and training as a Holistic Counsellor, which means that no matter what I say in the reading, I will give you practical ways of moving through any blocks. I won’t leave you in the lurch. Unlike some psychics, I don’t predict death or life expectancy (I believe some things are between you and God). However if I see signs in your numerology, palmistry or Tarot cards about possible illnesses etc. I will mention these. It probably won’t be a surprise – in most cases when I bring up symptoms, my clients say ‘oh I just saw the Doctor about that last week’, or ‘I’m getting treated for that’. Please see my post on The Five Craziest Things Psychics Have Told Me – Why This Industry is Buyer Beware for more info. Why do you include my past? I just want to know my future. In the readings that include numerology, I always discuss key turning points in your life to date (including specific ages, years and months), to give the reading credibility. A true psychic should be able to describe your history in detail, otherwise why would you believe they can read your future? Clairvoyance gives a psychic the ability to travel forwards and backwards in time to explore someone’s choices. When I have a reading, I expect my psychic to be able to tune into my past, otherwise the reading could just be a self-fulfilling prophecy. Last time I had a reading, the psychic’s predictions didn’t come true. Why not? There could be a few reasons. Firstly, did you record the session? It’s hard to verify what a psychic said unless you have a way of tracking things. Secondly, most professional psychics make it clear that nothing is ever 100% certain – you have the free will to alter your destinies. That said, a good reading should contain enough ‘hits’ to leave you believing that you’ve had a genuine psychic experience. If not, you have either found a psychic who isn’t as skilled as expected, and/ or you needed a wake up call. I have had some dodgy readings in my time, which pushed me to be more discriminating and develop my own intuition. Buyer beware. Do I need to prepare for the reading? Yes. depending on the type of reading I will need your birth name, current name, date of birth and/ or hand photos to prepare. More details will be texted or emailed to you once your booking is confirmed. You are welcome to write a list of questions to ask during the reading, we can go through these on the day. Please drink at least 2 litres of spring or mineral water the day of the reading, and avoid alcohol for 24-48 hours prior to the session. When you have alcohol in your system, it is harder for me to prepare your chart and read for you, as your energy is clouded. Fatigue greatly slows down the reading for both of us. What conditions are needed for a clear reading? Please ensure that you are in a private room with no one else present when taking the Skype or phone call. Pets are fine as long as they won’t distract you. If you have children, I recommend hiring a babysitter so that you can fully relax during the session. Or we can conduct your reading in the morning or evening when they are asleep. It’s best to eat before a reading in case the session goes overtime – hunger or thirst makes it harder for both of us to concentrate. Absolutely – I make a backup recording of every reading and encourage you to do the same. You can record your session for free using your mobile phone. Firstly, please put your phone on Flight or Plane mode, to ensure that we are not interrupted. Unfortunately, if you use Silent rather than Flight mode, the recording will stop when someone calls. On an iPhone look for the Utilities folder and an app called Voice Memos. On a Samsung phone, look for an app called Voice Recorder. How do I purchase a backup recording? You can Paypal or bank transfer AUD15 to me and I will email you a link via DropSend, usually within 1-3 weeks of receiving this payment. The file will need to be downloaded within 14 days, otherwise the link will expire. What happens if I need to postpone my reading? As long as you give me 72 hours notice by phone or email, I can rebook you at no charge. However if you give less than 72 hours notice, there is a $100 administration fee as I can’t always refill your spot in this time frame. It’s also an inconvenience as I may have prepared your chart already. I may choose to waive this fee in emergency circumstances, but not for changes of mind. Why do you hand write my chart instead of using a computer program like other numerologists? It’s my way of tuning in. As I write out your life purpose, turning points and name numerology, I receive useful impressions that help me prepare for your session. I think of these charts as love letters from your Soul. They are a summary of your original Soul or Akashic Contract, i.e. the job description you agreed to when you came to Earth. Maybe one day I will move to computer reports, but for now I love being old-fashioned! When was the last time someone took the time to write to you listing all your strengths and successes? It’s a special experience, especially in this modern world.